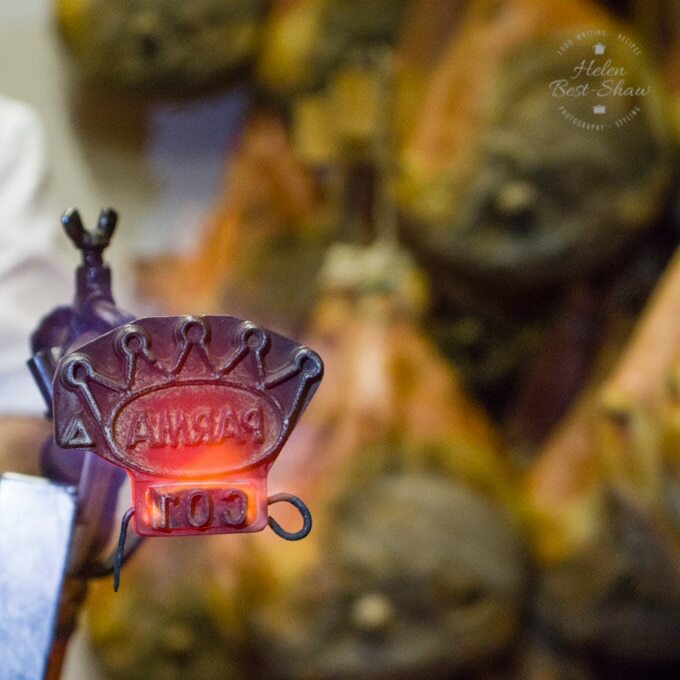 The process of making Parma Ham couldn’t be simpler: ham, salt, air, time and of course centuries of tradition and the skill, passion and expertise of the artisans who make it. 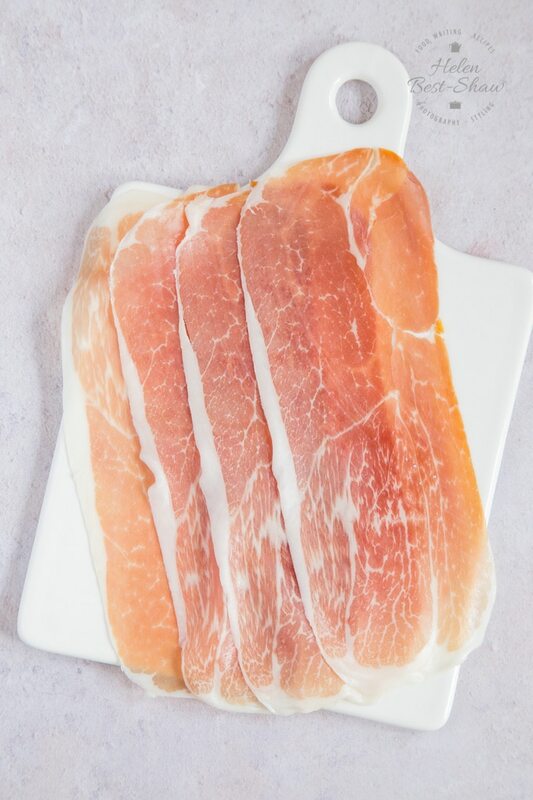 Parma Ham or Proscuitto de Parma is a delicious dry cured ham, richly flavoured with delicate pink meat marbled with pure white fat. Parma Ham was granted its Protected Designation of Origin (PDO) in 1996 and previously similarly protected by the Italian government in 1970. 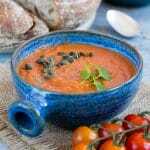 To receive PDO status, a food must be unique because it’s traditionally and entirely made in a specified region. It also has to be produced to specified rules. 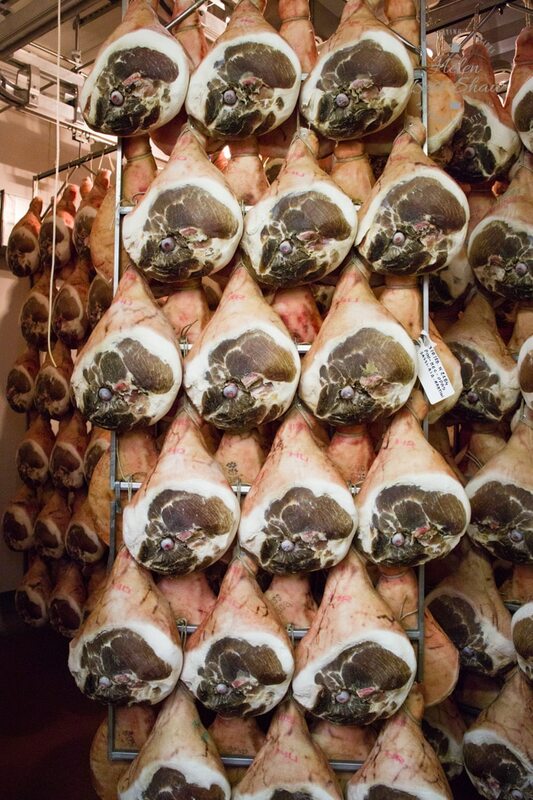 For Parma Ham, the pigs can be bred over a wider area of North Central Italy, but the hams must be produced within the Parma ham production area. These days the hams are cured in large, modern temperature controlled factories, but the techniques are traditional and still rely on the judgement of expert craftsmen. To start with the thighs of pork must be from Italian pigs from the ten regions of Northern Central Italy – 4,200 farms are authorised. The pigs are fed on high quality cereals, weigh about 160Kg and have to be at least 9 months old at the time of slaughter. The thighs are delivered to the factory within an average 48 hours after slaughter and must weigh at least 12kg each. The thighs are checked, weighted, marked and trimmed before being salted and chilled, to cause some moisture loss and to start the maturation process. After a week, this first layer of salt is removed and replaced and the hams are left again, this time for 15 to 18 days, depending on weight. 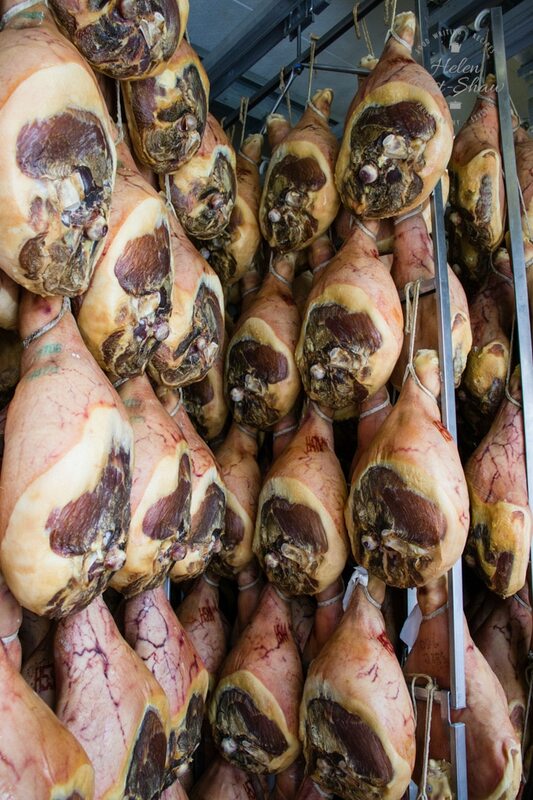 Salt is the only preservative used to make Parma ham. Next, the hams are hung on metal racks and left in cold rooms for a two to three months. The marks you can see here – the black dotted tattoo is the mark from the farm, the dotted mark with the date shows when the ham arrived in the factory. Slowly the hams change colour; the outer fat becomes yellower and they lose moisture. 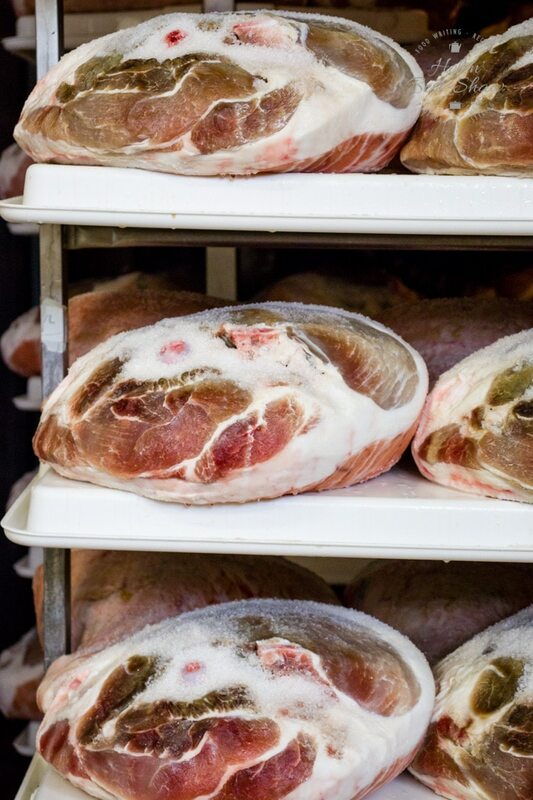 The salt is then washed off, and the hams are hung again, this time to dry. This takes a few days. The hams are now ready for the main maturation process. 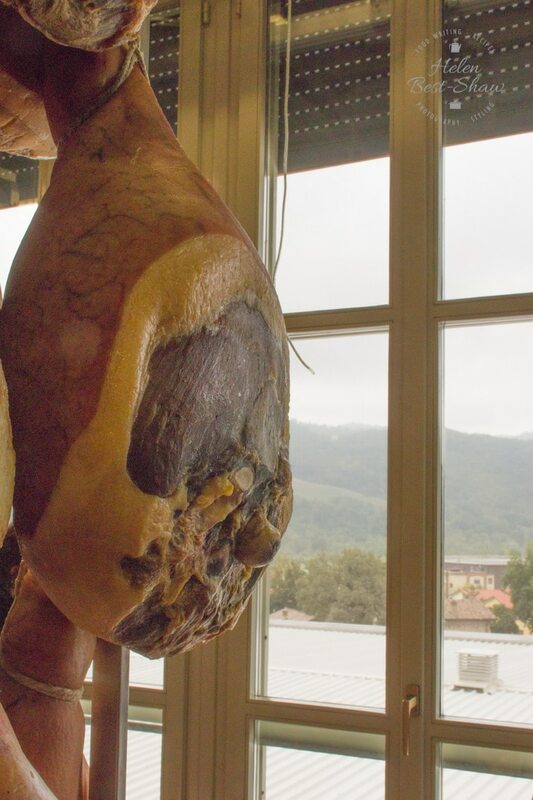 They are moved to the huge maturing rooms on the top floor of the factory, where the typical narrow floor to ceiling windows can be opened so the air from the hills around Parma can work its magic on the hams. They are continuously monitored and tested during their time in this room. A typical mature ham will weigh at least 8.5kg, a loss of about 40% of weight. This stage lasts about three months. By the end of this phase the surface of the meat has dried and hardened. The hams are then moved to the final maturing room, downstairs. That’s a lot of hams! During this last drying process the a layer of pork fat and rice flour is applied to the exposed part of the thigh to keep it moist and soft – a process known as sugnatura. Finally, the hams are ready for quality control and the application of the quality mark. After a minimum of 13 months of maturing the hams have one last test, where they are pierced at 5 points around the bone, using a horse bone needle. The horse bone is highly porous, and an experienced tester can tell by the aroma if the ham is good. We smelt the hams, and were surprised to learn that the aroma from each of the 5 points was appreciably different. 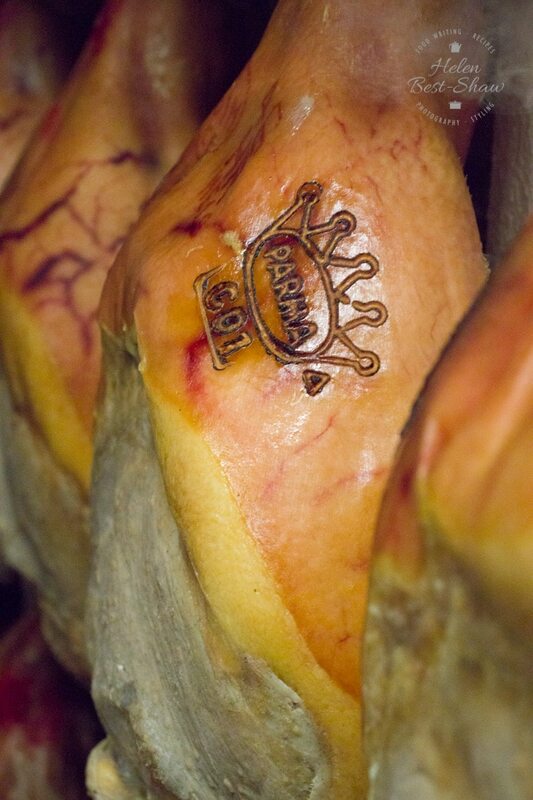 Finally the approved hams are branded with a hot brand showing the five-point Ducal Crown of Parma. Only hams that qualify for the PDO quality guarantee are branded. 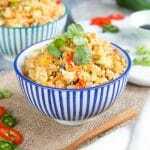 My favorite way is to enjoy it on its own – thinly sliced, fragrant, meaty with that wonderful hint of umami. The meat is pale pink with pristine white fat. 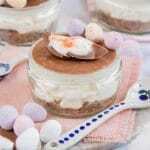 The flavour is soft, sweet and delicate, and the texture meltingly soft. 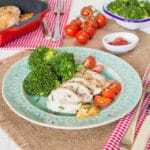 The one of the classic dishes of Parma is Rosa di Parma, a fillet steak, beaten thin and filled with prosciutto di Parma and parmigiano reggiano (the other product Parma is famous for). If you are in Parma you can find it at the Angiol d’Or, in the centre of Parma in the shadow of the Cathedral. Review of the Angiol d’Or on Luca’s Italy. 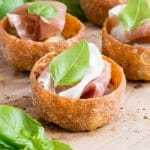 Parma Ham is a luxurious and rich tasting product, and little goes a long way, I’ve paired it with Gorgonzola to make these Parma ham canapes. 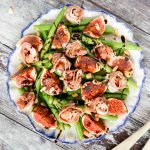 Or Parma ham makes a indulgent addition to a salad such as my Parma ham and fig salad. 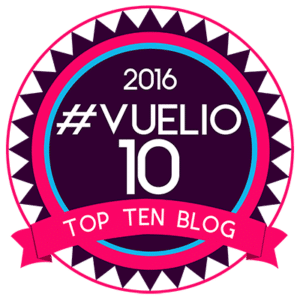 I was commissioned by Parma Ham to travel to Italy and to write about and share my experience visiting a Parma Ham producer. All opinions my own. Wow is such an interesting article. I like to learn something new for myself. Thanks! 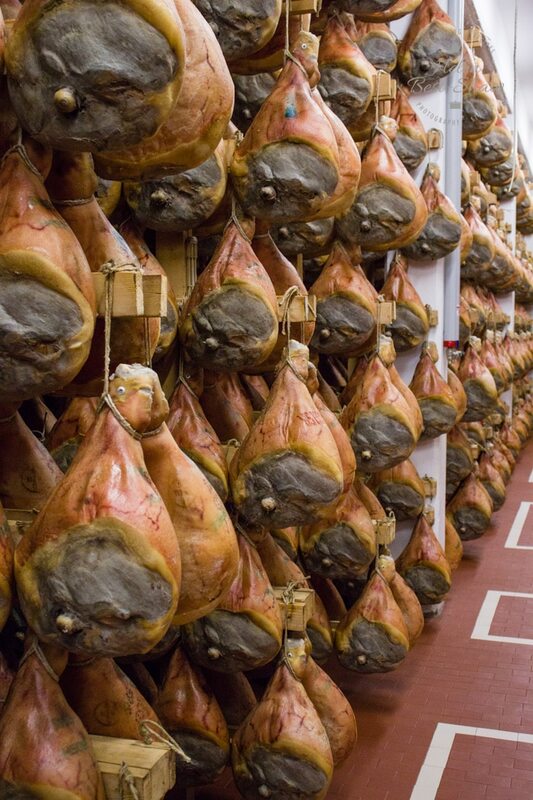 It’s fascinating to read about how parma ham is made and incredible to see so many hams together too. 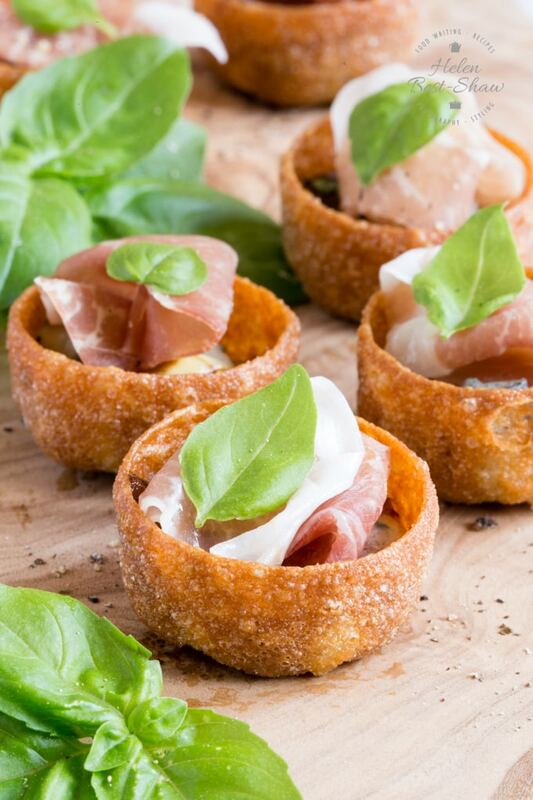 Those little canapes sound scrumptious as well. 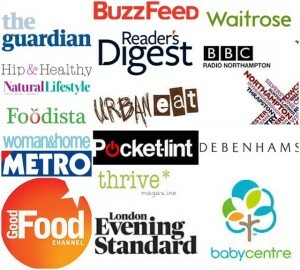 So many hams all together – quite over whelming in fact. 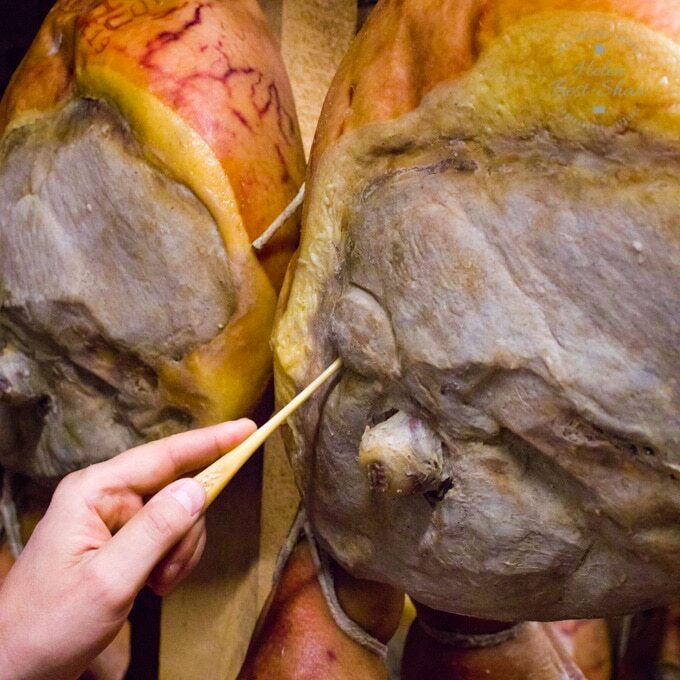 It really is fascinating to read about how Parma ham is produced. I wouldn’t have known. 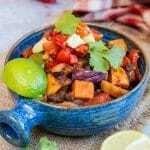 I just enjoy eating it. Such an interesting read. It really does take a long time to produce the ham. Pretty amazing. Parma ham is so tasty, I’m not at all surprised it takes so long to produce. I didn’t actually know it was so precise though. 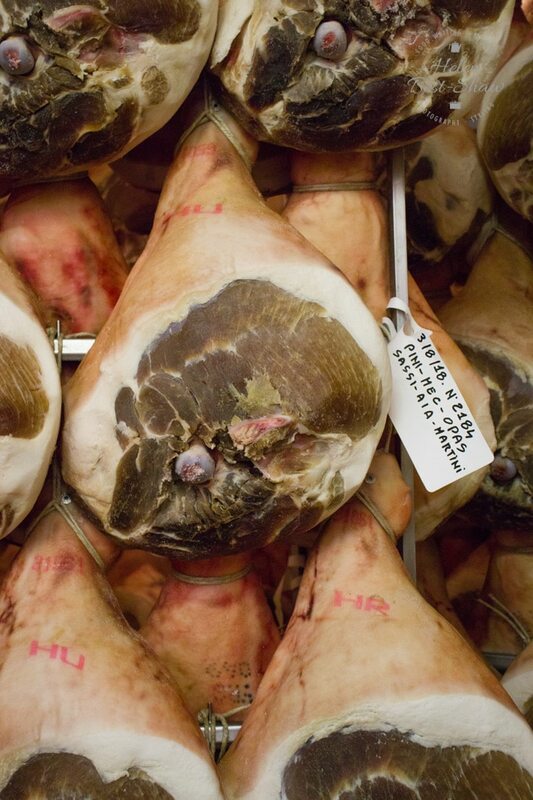 who knew that it takes over a year to produce parma ham. I didnt even know where it came from. Tastes good on pizza. That’s real commitment to food. Must have been great to actually see how the ham is cured and handled. I absolutely love Parma ham. 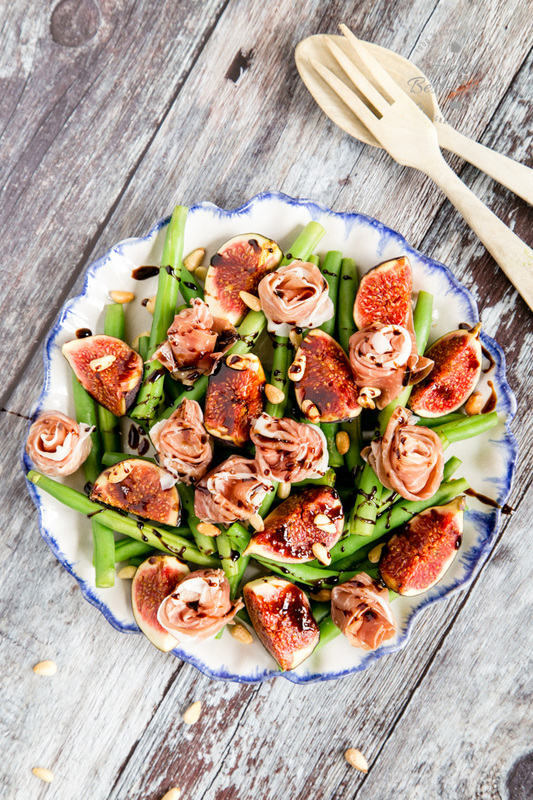 Your salad with figs looks amazing and just perfect for enjoying the flavours together. That sure is a lot of ham! 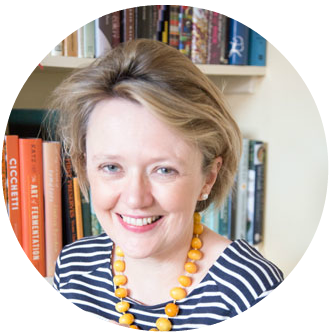 Such a good read Helen, it’s great to read the facts about producing the Parma ham. Wow! I had no idea what went into Parma Ham! Your article was so informative. 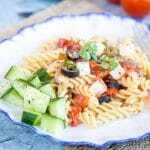 Now i’m both hungry and and really want to visit Italy. 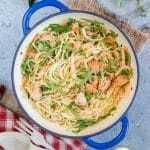 You dishes look and sounds amazing as well. This is fascinating, and what a brilliant sounding trip! 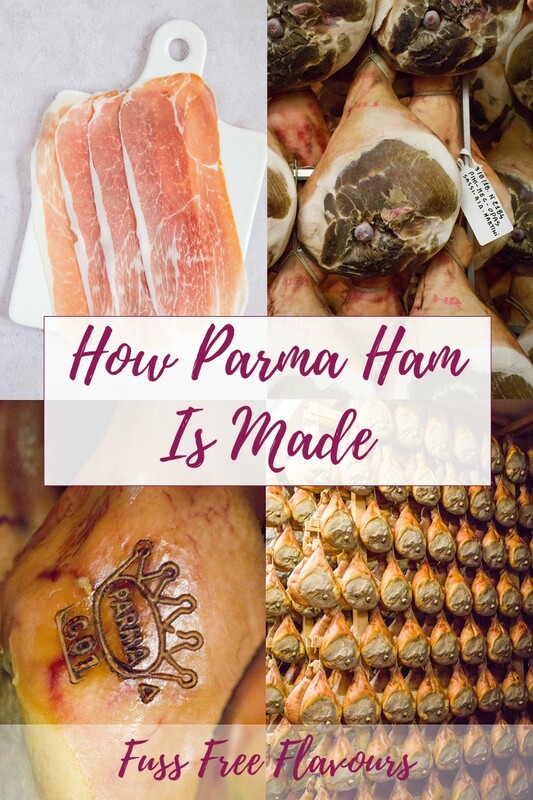 I adore Parma Ham but had no idea just how much time and skill went into making it. Genius! 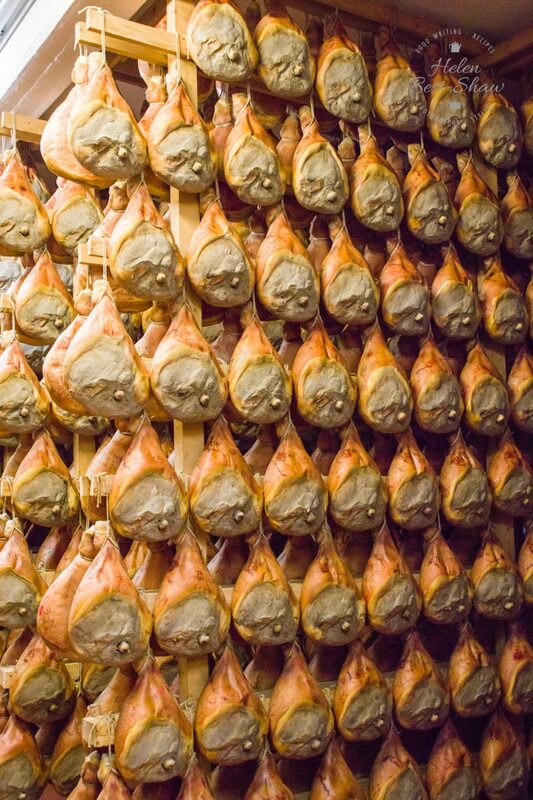 Time, pork and salt – and of course the unique climate outside of Parma are all that is needed. Wow, parma goes through such a long process to get so delicious. But it’s obviously so worth it.